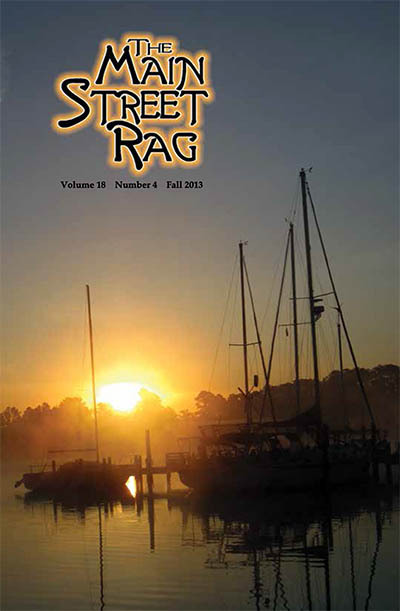 The Fall issue of The Main Street Rag, our quarterly literary magazine, features an interview with author Brian Walter Budzynski who was interviewed by Beth Browne. Also find poetry, fiction, reviews, photographs, reader feedback, and five Constitutional Amendment suggestions from editor M. Scott Douglass to help prevent future government shutdowns. Black Aperture by Matt Rasmussen, Allegiance & Betrayal by Peter Makuck, The Farewell Glacier by Nick Drake, Wind on His Wings by A.D. Winans, coming home by t. kilgore splake, Sprouts by Glenna Luschei, Captive Cities by B.Z. Niditch, From a Male Perspective by Gerald Locklin, What Were They Like by Julia Stein, Orbits’ Crossing by Peter McNamara. Elizabeth Renee Gonzalez, Anne Hicks, Jen McConnell, Richard Allen Taylor, Eric Weil. Beth Browne’s photographs were used on the front and back cover as well as the title page. With the skill of a master, Budzynski weaves these details into a plot that includes plenty of horrors, as this sort of story requires, but with an ample dose of redemption. There is no need for long, dull passages of reflection and Budzynski deftly leaves these out. What follows is a plot that makes perfect sense and is also endlessly surprising. The reader can’t put the book down because things keep happening. This is part of what is so perfect about the novella form. This book can be read in a sitting, or two sittings at most, because it is so beautifully succinct. The book is long enough to give a full development of characters and a vigorous plot, but short enough to be enjoyed in a short amount of time. Budzynski is a consummate writer and we are very pleased to be gifted with the opportunity to publish his first, and hopefully not his last, book. Brian Walter Budzynski earned his MFA from Roosevelt University, where he received the university’s thesis award. He has worked for Dalkey Archive Press, Fiction Collective 2, Other Voices, American Book Review, and Review of Contemporary Fiction. He presently edits books for a small publishing firm in suburban Chicago, where he lives with his family. Beth Browne: Your book, The Remark, is written so vividly that I had a picture in my head of you as the main character, an old man these many years later. In spite of the fact that I should know better, I was very surprised to see you are not your narrator. Tell me how this book came about. BWB: The narrator indeed is not me. But around the time I wrote it, and that period was a little over a year (I am a slow writer), I had been reading a lot of prison narratives and also books set in and around the Second World War. I was, at first, trying at some vague reach into my Polish heritage by way of aspects of recent history that had eluded me, or that I had never been exposed to in school, etc. Soon, however, I became deeply interested in what amounted to almost unimaginable trials of the body and spirit, most notably in the writings of Gustaw Herling. I was also reading, as many a graduate school writing student does, Nabokov, and so a sense of the absurd, or intensity of absurd events, was also in my mind. I was not interested in writing a straight historical narrative so the whole atmosphere (the barn, the castle) had to be singular. It had to smack of reality but be isolated from the grand scheme of what is known to have actually happened to men assigned to the camps of the gulag. I wanted to try to write something that stood for more than just telling a story. It’s cheap to write of war or torture or death or systemic cruelty for mere narrative purposes. There has to be more. There has to be a real try at limning the interior experience and what goes along with that are the small, horribly embarrassing details of such experience. No one really writes about what it means to have your insides emptying out of you as a result of starvation and beatings and bacterial infection, unless it’s a horror novel, and then the intent is to horrify, not to illumine the strength that underlies the truth that actual human beings have endured such things. Alongside this, I was interested in writing about the quiet, rural folk who sustained themselves and their culture through that dark time—but again not in a broad historical-narrative sense, more via the point of view of one particular man. Beth: Well, I would say you certainly succeeded in telling a riveting tale. It kept me up until the wee hours. I was captivated by the immediacy of the details, many of which have to do the imminent possibility of death. Have you ever been close to death? BWB: No, I have never been personally close to death. Pets notwithstanding. Beth: I’m impressed that you can write so well about subjects you have no personal experience with. Other than the books you mentioned earlier, did you do any research for this book? BWB: I never really felt I was doing research at all, at least not deliberately. I did read Anne Applebaum’s history of the Gulag, as well as Janusz Bardach’s Man is Wolf to Man, which I found particularly profound and moving. I was just following my interests. I know some writers choose a subject, research the hell out of it, and then write, but I don’t think I’ll ever be that sort of writer. I think I would only research a topic specifically for story or novel if I had written myself into a situation where that type of authority was necessary. 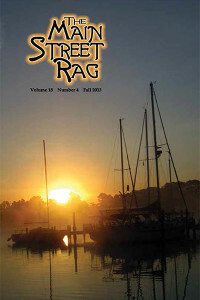 If you would like to read the rest of the interview, order your copy of the Fall issue of The Main Street Rag today. If you don’t read this issue, you’ll regret it for the rest of your life!! !